There are certain advantages to getting up early – especially when it means you get to look at views unobstructed. I woke up early while visiting Cambria, California and despite the early fog and clouds, I was happy to throw on a few layers and go for a walk along Moonstone Beach. 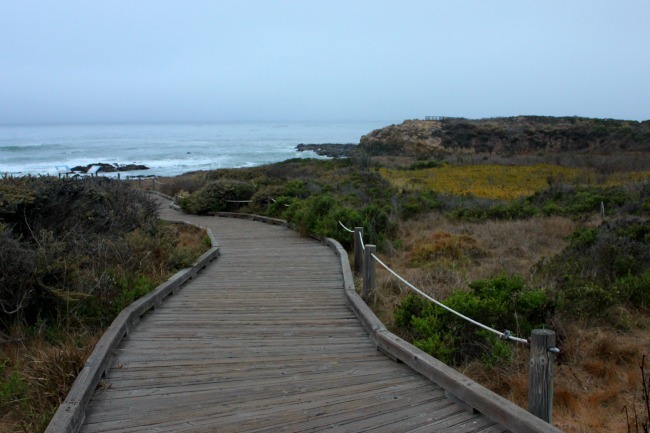 The wood walkway hugged the coastal edge, which was several metres above the ocean, but close enough to smell the salt, and feel the fog in the air. As I walked along the wooden boardwalk, I occasionally spotted residents – either walking briskly as part of their morning ritual or walking their dog, who always seemed to want to stop more and smell some unique scent. But it was the rough, natural coast that kept my eyes and camera lens trained on the view – the rock and the water, the surf churning up the white water and the plants, clinging onto the cliffs or the ones floating on top of the sea. It didn’t need to be sunny and blue skies for me – this dull day was just as intriguing. And although I knew eventually the sun would come and burn off the fog, the neutral shades of Mother Nature were beautiful – and I knew it was worth it to get up early and experience it.